Inex Gorica is a resort situated on the coast of Ohrid Lake, at just 4 km from Ohrid City centre and 15 km away from Ohrid airport. 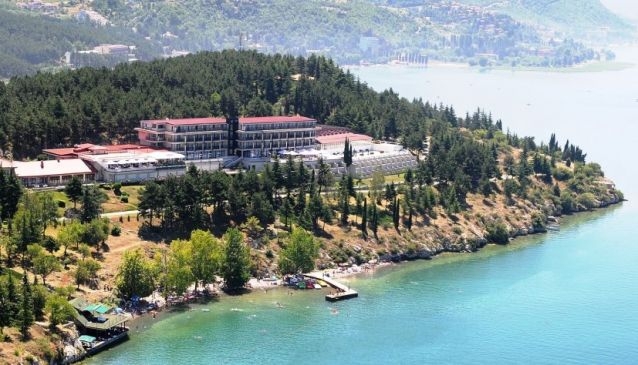 The hotel stands proudly with a five star ranking, positioned on the most attractive part of the Ohrid lake coastline surrounded by pine forest. The surroundings give a feeling of comfort, the beach is in between sheer cliffs and the rooms have an ideal view of the Ohrid riviera. The five star hotel can cater the needs of every guest, especially the more demanding ones which puts it at the forefront of customer service.